The scenario include just "invisible object effect". So if you want to know how to make these effect, read below. Thanks. 1. Create any unit (without "Other") on the map. 2. Save the scenario and run AOKTS. 3. Change frame of unit to "99999" and save scenario. 4. Return to AOK and load the scenario. 5. You can find invisible unit. Unlike using invisible tile, this change frame method cannot hide the building from player perfectly. For example, you can see flame on the building. With some triggers, this effect will be more powerful like attached file. This utility contains a new discovery as far as I'm aware of. Vanilla designers can now make placed units/buildings invisible, as well as achieve a variety of other effects. This trick is quite similar to the POREX villager trick. The first difference is that any object other than objects from the Others list can be invisible. (Except for farms, and maybe other units) Second, moving the unit manually, by automatic attack/run, by task effect, or by patrol effect will turn them visible again. If you use the unload effect, they will remain invisible as long as none of the above affects it. Another trick that can be done with this is creating invisible barriers. If you use gaia walls and make them invincible, you have a 1 tile barrier at your disposal. The most important thing that this trick can be utilized for is to create fire. 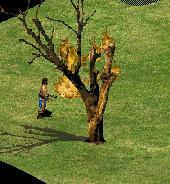 Designers can now make fires from buildings and trebs rather than farms. This particular trick will shine during cutscenes where different varieties of fire is needed. To conclude, this trick can be used to achieve a lot of effects that invisible tiles, cloaking, and porex can produce. Great job finding this out, and thanks for sharing it! The invisible object is a great utility that replace most of known tricks. Can be used instead of cloaked-units for renaming effect, instead of farm trick for fire effect, instead of porex for swim effect , etc. No more lots of triggers and hard-working with this new feature . It's the greatest discovery since I registered in 2008 . Great ! I'll post in Forum to be posted in Blacksmith Features . The Invisible Object is a completely new trick discovered by truedew12. It makes any object of your choice turn invisble by changing the frame of the object in AOK Trigger Studio. Te guide provided is clear and very easy to understand. and there is also a scenario showing you some uses of the invisible object. The Invisible Object can be used insted of POREX-villagers, Invisible Farms, ITs and TIC. It can be used for swimming, Burning Trees and load, loads more. The only problem with this is that you must have to have AOKTS downloaded to use it but that isn't a major problem. The Invisible object is probalby the greatest discovery since Sliced Bread anbd is a MUST download! Download It Now! Thanks for the great find truedew12!